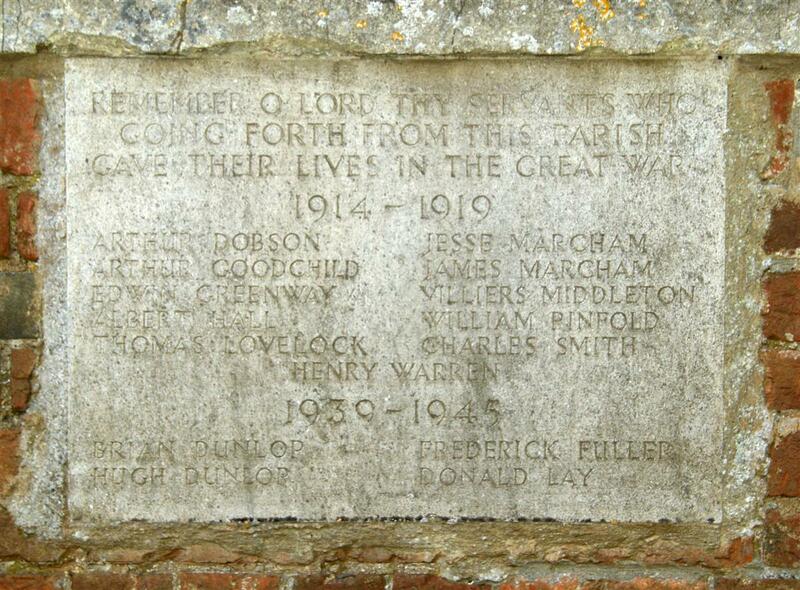 Aldworth War Memorial – Dedication Service, 13 November 1921. War Memorial – The unveiling and dedication ceremony took place on Sunday afternoon, November 13th, of a beautifully stained glass window to the memory of the men of Aldworth, who gave their lives in the great war. It was dedicated by the Vicar (the Rev A L Warner), and the unveiling was performed by four ex-Servicemen, three of whom had lost brothers in the services. A large number of ex-Servicemen and relatives of the fallen were present. The preacher was the Rev H B Phelips, of Compton. The tablet, bearing the names of the fallen, and placed outside the window was then unveiled, after which the “Last Post” was sounded. The names of the fallen are:- Arthur Dopson, Arthur Goodchild, Edwin Greenaway, Albert Hall, Thomas Lovelock, Jesse Marcham, James Marcham, Villiers Middleton, William Pinfold, Charles Smith and Henry Warren.